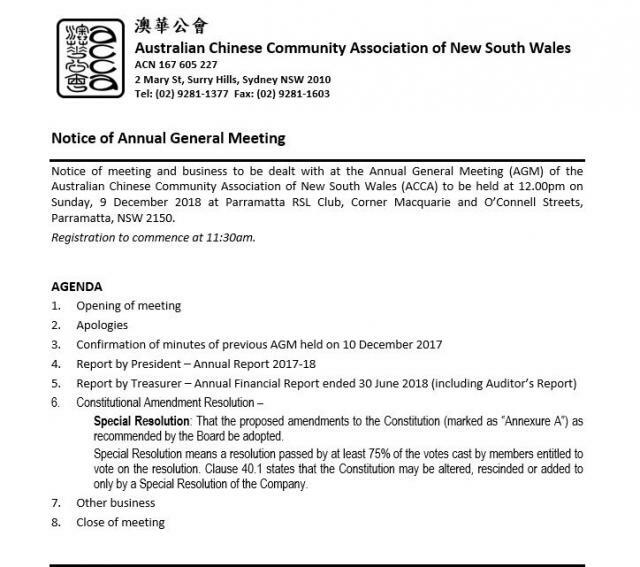 Notice of meeting and business to be dealt with at the Annual General Meeting (AGM) of the Australian Chinese Community Association of New South Wales (ACCA) to be held at 12.00pm on Sunday, 9 December 2018 at Parramatta RSL Club, Corner Macquarie and O’Connell Streets, Parramatta, NSW 2150. Registration to commence at 11:30am. Special Resolution: That the proposed amendments to the Constitution (marked as “Annexure A”) as recommended by the Board be adopted. Special Resolution means a resolution passed by at least 75% of the votes cast by members entitled to vote on the resolution. Clause 40.1 states that the Constitution may be altered, rescinded or added to only by a Special Resolution of the Company. Printed copies of Annual Financial Report 2017-18 can be obtained in person from ACCA City Centre Office or by contacting The Administration Manager on Tel: 9281 1377 or email: info@acca.org.au. Electronic copies of same are also available from the ACCA website www.acca.org.au. 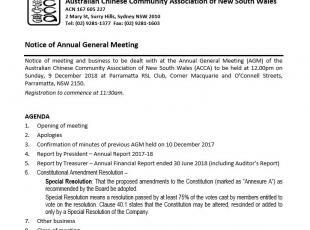 Note: Only Life Members, Honorary, Honorary Life, and Ordinary Members who have joined for at least 6 months prior to AGM and whose membership is financial before 4pm, 23 Nov 2018 are eligible to vote at the AGM. Membership renewals may be made in person at ACCA, 2 Mary St, Surry Hills or by calling 9281 1377 during office hours. We accept Visa and Mastercard only.